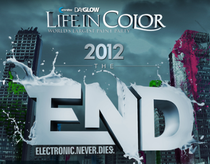 Dayglow (Life in Color), the proclaimed “World’s Largest Paint Party”, recently announced their most ambitious tour to date with a staggering 30 dates already confirmed for their “2012 The E.N.D (Electronic Never Dies) Tour”. 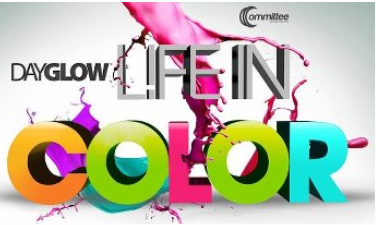 Taking the paint party to new levels of production, technology and talent, Dayglow events are meticulously designed and produced, the refined culmination of years within the now booming electronic music industry. Their events now play host to some of the globe’s most electrifying DJ talent, including Sander van Doorn, Chuckie, Alesso, R3hab, Axwell, Laidback Luke, Benny Benassi and resident Dayglow DJ David Solano, who have all graced the stages of Dayglow in 2012. Dayglow, along with parent company Committee Entertainment, have been a key player in the world of dance music festivals for some 10 combined years with over 200 sold out shows already to their credit. The promoters have brought the festival to an international audience as well, having showcased the Dayglow experience in Poland, Australia, Mexico, Dominican Republic, Canada and Ecuador.